Way back when we started PELOTON we had a tiny, two-room office next to a guy named Bill who was starting his own business: Fioré Market Café. We became fast friends with Bill and his wife and co-owner/creator, Anne. Over the years we've eaten everything on their menu– and like it all! Including the daily specials. It's all fresh. It's all made with care including the homemade bread that's baked daily. Often, during the real busy days, Bill and his colleagues will bake more than 90 loaves! Bill always tossed around the idea of making a recipe book, but not in the traditional sense. It would be mostly recipes, but also have great stories about travel and what inspires his menu. Bill came to us to build this book and so we did! 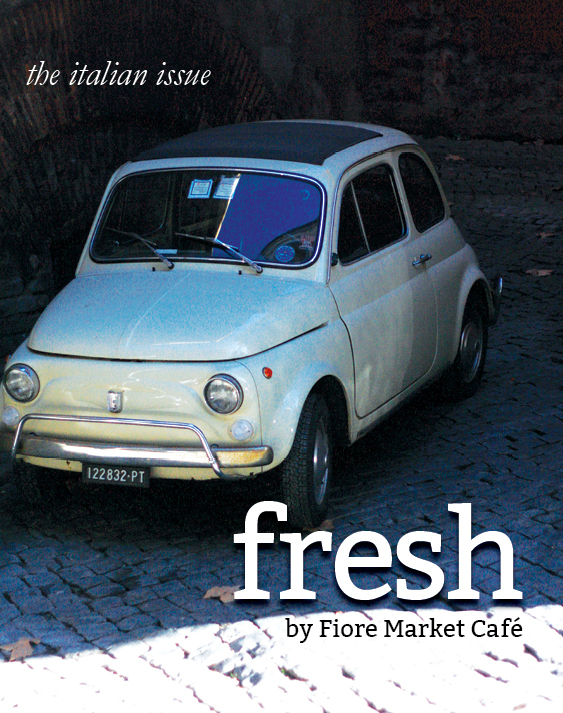 This particular issue has inspirations and tales from Bill and Anne's (may Anne rest in peace) second home– Italy! The book is approachable in the sense that you can make what's inside. All it takes is good ingredients, time and patience. As a bonus, we'll throw in a printout of how to make Bill's famous bread. It's a timeless method that's easier than you may think. This makes a great holiday gift.